Uber is not out of the woods yet. 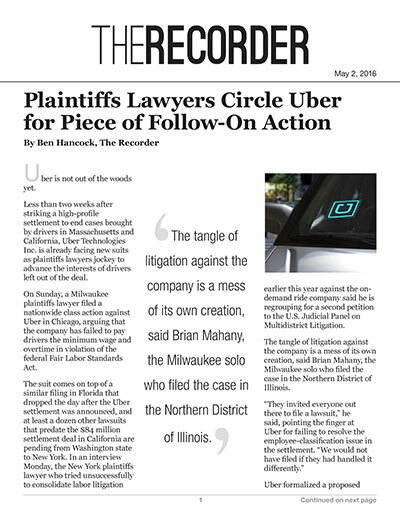 Less than two weeks after striking a high-profile settlement to end cases brought by drivers in Massachusetts and California, Uber Technologies Inc. is already facing new suits as plaintiffs lawyers jockey to advance the interests of drivers left out of the deal. On Sunday, a Milwaukee plaintiffs lawyer filed a nationwide class action against Uber in Chicago, arguing that the company has failed to pay drivers the minimum wage and overtime in violation of the federal Fair Labor Standards Act. The suit comes on top of a similar filing in Florida that dropped the day after the Uber settlement was announced, and at least a dozen other lawsuits that predate the $84 million settlement deal in California are pending from Washington state to New York. In an interview Monday, the New York plaintiffs lawyer who tried unsuccessfully to consolidate labor litigation earlier this year against the ondemand ride company said he is regrouping for a second petition to the U.S. Judicial Panel on Multidistrict Litigation. The tangle of litigation against the company is a mess of its own creation, said Brian Mahany, the Milwaukee solo who filed the case in the Northern District of Illinois. Uber formalized a proposed settlement with plaintiffs lawyers April 21 in a suit pending in U.S. District Court for the Northern District of California. The agreement would create an $84 million settlement fund and establish certain protections for drivers but does not resolve the dispute over their designation as independent contractors. The Chicago suit appears to be the second since the peace pact was struck. Gerald Richman of Richman Greer in West Palm Beach, Florida, filed a similar suit against Uber in the U.S. District Court for the Southern District of Florida on April 22. Richman said that his firm had been planning the lawsuit for weeks but “accelerated” the filing after the settlement was announced in anticipation of other follow-on cases. The aim in filing expeditiously, he said in an interview, was to position himself for a plum role if the cases are consolidated. “There’s some advantage to filing sooner rather than later,” Richman said. Hunter Shkolnik, a partner at New York plaintiffs firm Napoli Shkolnik, is leading several suits against Uber in New York, North Carolina and Tennessee, among other places. Earlier this year, the Judicial Panel on Multidistrict Litigation rejected a bid backed by Shkolnik to bring the pending cases together, reasoning that the standards vary state to state for determining whether a worker is a contractor or employee. But Shkolnik said in an interview that in light of the settlement and the new cases that emphasize federal issues, he may again petition the panel to centralize drivers’ claims against Uber. “I think we’re going to see Uber II,” he said. An Uber spokesman declined to comment on whether the company still opposed consolidation. Andrew Spurchise of Littler Mendelson, who represented Uber in those proceedings, did not respond to messages seeking comment. If the cases are joined for pretrial proceedings, there would almost certainly be a clamor among plaintiffs attorneys over who should lead the effort. “That’s the next fight,” Shkolnik said. A key piece of the settlement with the Massachusetts and California drivers would make it harder for plaintiffs lawyers to follow that litigation. Under the proposed deal, U.S. District Judge Edward Chen of the Northern District of California would vacate an order from December finding that Uber’s latest arbitration agreement is unenforceable. That would mean that lawyers in the other cases would have to fight that battle again in order to avoid seeing their plaintiffs corralled into private arbitration. Chen on Thursday afternoon denied the proposed stipulation without prejudice, pending a review of the settlement, for which a hearing has been set in June. Shkolnik was sharply critical of that element of the deal. “How does class counsel in good conscious agree to vacate that decision?” he asked.